How sweet! I have a plate just like the one in your picture. And the song is a great way to start a day (to jazz up). thanks for sharing. 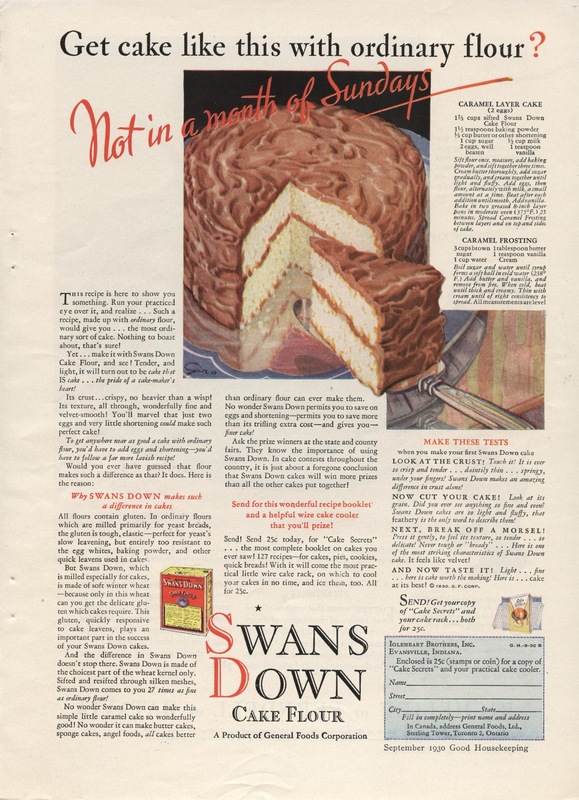 Love that vintage ad...your cake looks fabulous on your china! I can't believe how much snow you've had - even more than us. I think cabin fever sets in and then you just have to get out! Yum! Thake cake look soooo yummy.. save us a slice! i ve had to take a break from baking for a while :( as ALL my dresses are starting to get a bit tight! I never heard of this singer before and she really is wonderful. I listened to a few of hers songs through your link. How did the cake taste? I looks great. I adore Annette Hanshaw too! Fun to listen to on a Sunday morning...thanks! The cake was delicious! Pre-war cake recipes will knock your socks off! I just saw this... the cake looks so good! I was actually taken aback a little bit by the ad at the top...I say "month of Sundays" all the time! It's up there with "I haven't seen you in a dog's age" for "indefinitely long period of time" replacer. So, in use: "It's been a month of Sundays since we saw the likes of you!" It might help to have a mild Southern accent to pull this off. :) I think I got that phrase from my grandma...and now I have a more tangible provenance!